I was writing a short story one day a year or so ago, and I needed the word for one of those small waves that washes into shore. You know, the ones that squealing toddlers get lifted over, that little children run backwards from, that bring the flotsam and jetsam of an uncaring world to deposit on the beach? Wasn’t I surprised to find it in my dictionary, the following day! Wavelet. Noun. A small wave, a ripple. Exactly what I had wanted! Don’t you just love the English language? Jan 1, 2016, saw me decide I needed to ‘practise’ my writing. I realised that I’d never get anywhere if I just started a story, get stuck, get frustrated, start another story, and repeat the same process. Mentally, I compared this to my chess game. Okay in the opening, wobbly in the middle, and pretty woeful at the ending. I decided practise was in order. Practise of ‘end-game’ stuff; then recourse to the middle, and finish at the beginning. So: I worked out the final sentence (above) and worked backwards. Ended up with a 1500 word short Sci-Fi story about two teenagers crash-landing their spaceship onto an unknown planet. Fast forward a few weeks, and I related this story to the members at Beerwah Writers Group. Inspired, they used my final sentence, and produced their own stories. I joined them, and ended up with a 500 word story about a Greek God who’d been cast out from Mount Olympus. Prophemius, I called him. God of the Future… except his powers were stripped from him, meaning he couldn’t see the future anymore. But I always come back to the fact that it’s good I don’t know. I’m glad, deep down, that I’m in the same boat as everyone else. That the future – for all of us – is an unknown. I like that. We’re all on the same playing field, as it were. And there’s so much freedom in that! Have a lovely day, dear Reader! Ah, the monteith. A large bowl, commonly made of silver, often with a rim for suspending drinking glasses in the cool water within the bowl; also used as a punchbowl. 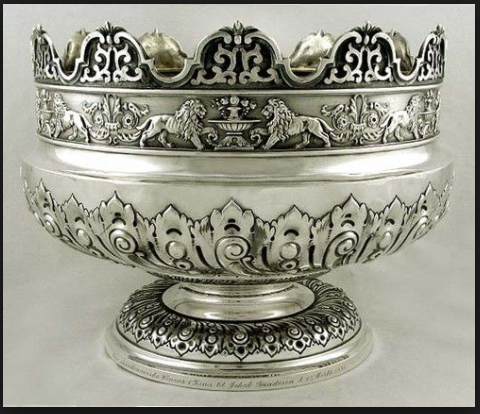 This one, above, I found on Pinterest (I realised I needed to search ‘monteith BOWL’ after a ‘monteith’ search brought up photos of Cory Monteith, of Glee fame) – and it apparently is a Victorian period reproduction of a C1685 Charles II period Monteith bowl – this English sterling silver monteith or punch bowl is by James Dixon & Son, Sheffield, c1905. So I wrote a 100 word story last weekend for the flash fiction contest on Janet Reid’s blog (literary agent extraordinaire, QOTKU and now agent-wrangler at New Leaf Literary and Media) with the five prompt words: dog, horse, proud, spirit, and herd. I must admit, I was pretty happy with my entry. I was happy with the ‘Adam naming the animals’ leading into the ‘creation of Eve’ sections – but perhaps that didn’t leave enough space to develop the antagonist’s POV enough. I emailed it to another writer friend, but – I didn’t know at the time! -he’s moving house. He apologised about not replying; I said please don’t; he has enough on his plate! I then fell sick a few days back, so was unable to make it to my local writers’ group meeting. I had another member read out my story for me. Her response? “Everyone enjoyed it.” Which is nice, but not particularly detailed. Sigh. So I’m still left wondering – is it pacing? Is it too Christian? Is it too Satan-ic? Or is it just, simply, too obscure? The man gazes at the creature. “Dog.” The angel scribes, nods; then disappears into the spirit realm. The Master inclines his head. Ancient eyes close. I smirk. This’ll be easy. Later still, she explores the garden, head erect; her desire to please ripe for the plucking. 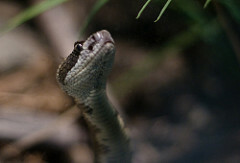 I slither over; make my move. Offended, proud, she seeks to best me in a match of wills. So – do *you* think that pacing may be an issue? And have a lovely week, dear reader! The man in the bed next to him didn’t have long to live. He was 87, after all, and had been ill for months now. Nathanael watched him sadly, wheezing in his sleep. It was such a waste, it truly was. Nathanael had guarded hundreds – if not thousands – of humans before. He’d been assigned to them when they’d finished their terms as innocents, and stayed with them until their last breath. Then he’d been assigned a new human to guard. Every assignment presented its own challenges, its own highlights. No two were identical, just as each of the Master’s creations was unique. But this last assignment left him saddened. It had been easy, but that in itself had been part of the problem. It had been too easy. The man wasting away in the bed next to him had not lived. Not in any meaningful way. Yes, he had been alive, but he had never lived; he had only existed. And they were very, very different things. This man, his current assignment, was the second child of three. Overshadowed by both his brothers in intelligence, the man had made up his mind at an early age that he would never amount to much. He had lived with the ridicule of his siblings and the disappointment of his parents, and so had found it difficult to make friends at school. His peers didn’t like him; he’d never gone out of his way to be friendly. By graduation, he’d been friendless. Average school marks had meant that further education wasn’t an option, so he’d gone into the workforce, helping out in his father’s business. And he’d stayed there. Sixty years later, when society had forced him to retire, he’d stopped going to work and stayed at home. The home which he’d inherited from his parents after their death, after his brothers had moved on to bigger and better things. Successful careers. Marriages. Families. Houses. Overseas holidays at ski resorts. This man, though, had had none of those things. He had told himself that he didn’t want to be seen to be ‘ambitious’ – but really, Nathanael thought that it was because he was scared. Scared of what might happen if he had tried. Scared to succeed; scared to fail. Coasting, making as few decisions as he possibly could, carried less risk. So that’s what he’d done. He’d never married. Never had anyone that he could call friend. Never even owned a pet! The man had deliberately chosen to be responsible for no-one and nothing. He had told himself that he had preferred it that way. Nathanael wondered if that was true. It wouldn’t be long now, Nathanael knew. The man’s breathing was becoming more and more erratic. With his angelic sight, Nathanael could see the man’s bodily systems labouring with more and more difficulty, then starting to shut down. The man had just minutes to live. But what is a life? thought Nathanael. Is it just the number of breaths measured out to a man? Is it the seconds that he has between conception and death? Or is it the decisions that he makes in the time allotted to him? The emotions he allows himself to feel? The experiences he chooses to have? The Master had created humans to be social creatures. He had created them to be part of community. To care for each other. Life was about living. Not just existing, oblivious to those around you. A life without choosing to interact with others was no life at all. Nathanael knew this. He had had enough experience watching lives to be utterly convinced. This man, who had lived without thought for others, had done little harm to them. But neither had he done any kindness. And that was such a waste. He could have done so much good! He had had the opportunity for wealth – and with it, the opportunity to be generous with that wealth. He had had the opportunity for friendship – and with it, the possibility of choosing to make others happier. To make their lives easier. But he had chosen to live his life as risk-free as possible. He had chosen a life without social interaction. A life of solitude. A life alone. A life wasted. It was almost criminal. To have so many opportunities, and to neglect to nurture them. It was so sad. Nathanael watched as the man took his last breath. He watched as his heart beat its last time. Nathanael watched as his soul departed, to the place where all souls went, ready for the final judgement. Nathanael sighed. A final reflection on this man’s life. Then he too departed, thinking with hope of the next life that he would guard. He wondered who his next assignment would be. The man’s body lay almost as still in death as his spirit had been in life. Unremarkable. So – did you like it? I’d love to hear your thoughts! Please feel free to leave any and all comments below. Limitations: Use 100 words (or fewer). Include the words: may, play, whee, brie, and quick. Submit within 48 hours. Daddy, quick – watch me slide! Whee! Sally, four. All giggles, sloppy ice-cream kisses. Daddy, please may I have Jaimee over to play? My daughter, nine. Nudges and whispered secrets. My own car? Thank you, Daddy! Squeals; hugs of gratitude. An aisle; a walk; a bride on my arm. Tears, threatening, choked back. My heart too big for my chest. These memories should be treasured forever. But they’re ones I’ll never have. The tiny limp body in my arms? My Sally? I curse the day brie was created. Response by Flash Fiction contest judge and Queen of the Known Universe: Shortlisted!!! WOOT!!!!! My local Writers’ Group meets this Friday morning. And our challenge is to write 500 words (maximum) about bushrangers. NOT my most favourite of topics, so I’ve been putting it off. I’m posted my efforts on my ‘Short Stories’ page, if you’re interested.